I folded myself into the backseat of the small Mercedes taxi. The driver, a deeply tanned man with a quick smile, looked at me in the mirror. “American, yes?” I had been in Lisbon for only 20 minutes, and already I had a chance to say what I had been practicing during the entire flight. “No sir, I’m Portuguese,” I replied in the slow, measured words of my new language. I explained that my father was a Portuguese citizen when I was born, so by law I was eligible for dual citizenship, which after two years of loopy phone calls in “Portglish” — my pidgin Portuguese — I finally received. This was my first trip to Lisbon. “Congratulations!” he said. “Then you must permit me to show you your new capital city.” Who was I to argue? The Portuguese are notoriously fast and wily drivers, and mine did his countrymen proud. We caromed down the Avenida da Liberdade, Lisbon’s answer to the Champs-Élysées, which is lined with boutiques, the grand neoclassical Tivoli theater, and the offices of Diário de Notícias, one of Lisbon’s oldest and largest newspapers. 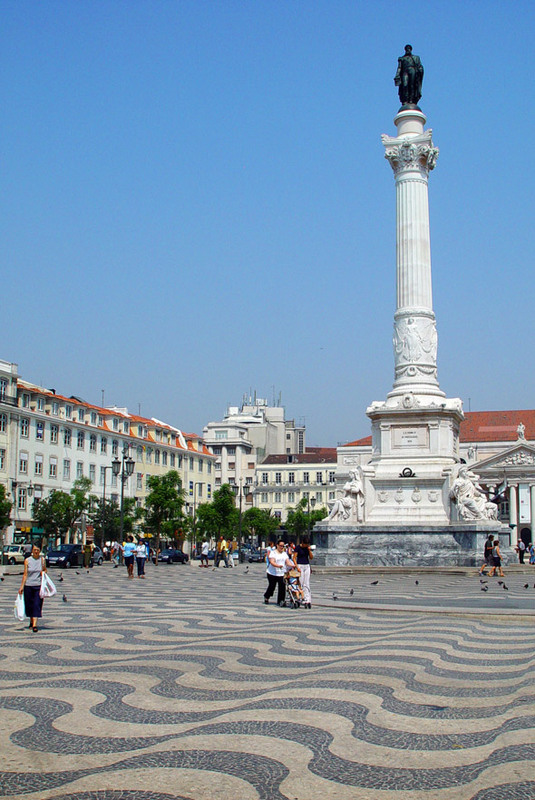 We hurtled around the graceful Rossio (above), a large square paved with cobblestones in a dizzying wave pattern, winning it the nickname of “Rolling Motion Square.” The square is crowded with shops, tabacarias, and lively outdoor restaurants and cafés, including Café Nicola, one of the oldest haunts of Lisbon’s literati. Off to the right was the famous Elevador de Santa Justa, a Neo-Gothic funicular built at the beginning of the 20th century by an apprentice of Alexandre Gustave Eiffel’s. The elevator was ostensibly designed to transport Lisboetas from Baixa, the lower part of the city, to the Bairro Alto district above. But I suspect with its delicate wrought iron filigree and imposing 150-foot height, it was more of a folly to show the world just how sophisticated this once-forgotten corner of the continent was. As the taxi finally pulled up to my hotel, the Lapa Palace, it was already clear that Lisbon is a charming town that’s mending her tattered edges. During the heady days of the Age of Discovery, Lisbon was a world leader, thanks to Portuguese innovations in navigation. Soon, though, it was hip-checked into early retirement by larger, more powerful cities that grew wealthy exploiting the trade routes she had blazed from Brazil to Macao. But since Portugal joined the European Economic Community in 1986, there’s been an influx of trade, culture, and much-needed money. As a result, ornate façades everywhere are being restored, but the colorful mottle of centuries of peeling paint — the divine decrepitude — has remained. Like those of Rome, Lisbon’s neighborhoods are spattered across seven hills. Since I was seeking classic Lisbon, its food and culture, I put Bairro Alto (restaurant central) and Alfama (the oldest section) at the top of my must-see list. 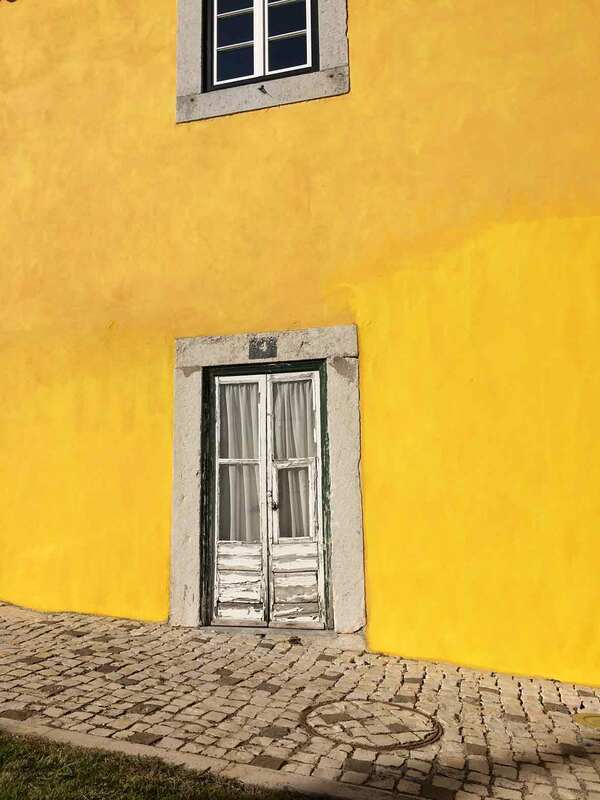 “For many Lisboetas, Alfama is the soul of the city,” said João, a spry elderly gentleman who was out for his morning walk “to give the wife some air.” When he saw me wrestling with a map on the steps of Sé cathedral, he offered to be my guide. As we walked along the labyrinthine streets, many of which now bear only pedestrian traffic, João explained that what makes Alfama so special is that it survived the devastating earthquake of 1755. While most of the city, which was either destroyed by tremors, fires, or a massive tidal waves, sprouted back with grand boulevards and spacious plazas, Alfama retained its jumbled, old-world charm of brightly colored buildings piled high atop each other. “It’s a glimpse into our dark past,” he smiled. I felt as if I were beneath a great circus tent, for strung everywhere were crisscrossing lines of laundry flapping like so many flags. Deeper into the district, the streets suddenly narrowed to alleys, then to dark passageways, many ending in a tumble of stairs that deposited us into hidden courtyards shared by the bordering homes. Because the day was already hot, stout women with broad, friendly faces sat on the thresholds nattering away while children zigzagged back and forth, their game a tumult of shouts. Noon struck and so did hunger. João returned to his well-aerated wife, and I headed to the restaurant he recommended. 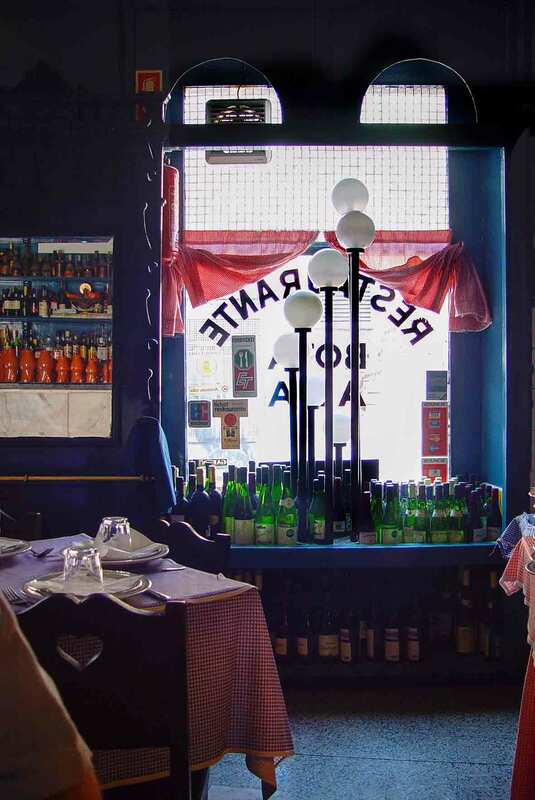 Restaurante Faz Figura has held sway over the lower portion of Alfama for 29 years. My table was on the covered terrace, which opened up to a view the Tagus River. At the insistence of owner José Fernandes, came a cold marinated octopus salad to start, which gave me pause until he placed the plate in front of me. The slivers of pristine white fish were nothing like the bowls of purple octopus stew that were foisted upon me in my childhood by a well-meaning but culinarily misguided aunt. 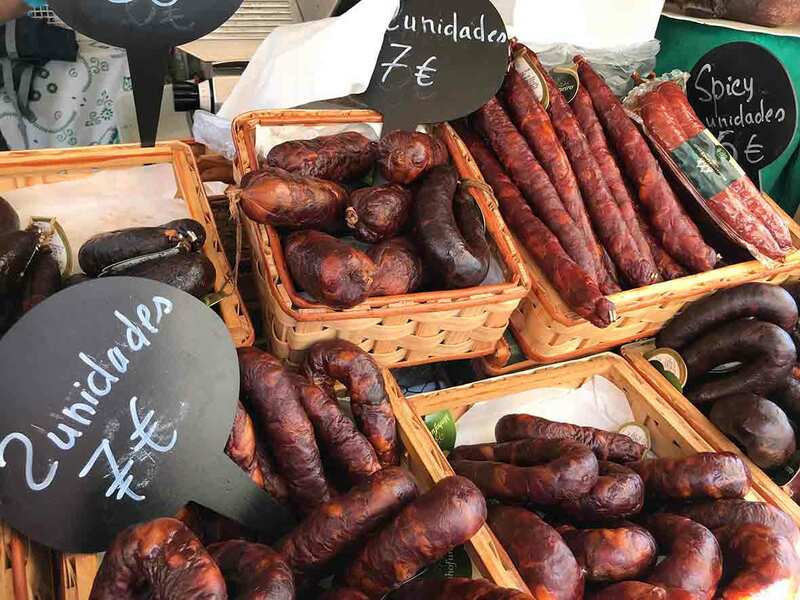 The flavors were clean and bright with a sting of good Portuguese vinegar. Seared skate and shoulder of roasted kid followed. Both were served up with mountains of tender sauteed couves (Galician kale), roasted garlic, and potatoes. Fortified by lunch, I decided to tackle Castelo de São Jorge, the imposing onetime Moorish castle that crowns the district. The ramparts of the fortress open up onto the most spectacular panoramic view of Lisbon. From here the city’s hilly disposition is easily seen, and the view is best taken in during the morning hours as the sun warms the vivid red-clay roofs and illuminates the stark white façades below. The reverse and equally arresting view is on the opposite side of the city at the Miradouro de São Pedro de Alcântara, a park on the precipitous edge of Bairro Alto. At dusk the same roofs turn a burnt sienna and the buildings warm with a brilho dourado, a golden glow. Sitting there nibbling rustic peasant bread smeared with Queijo da Serra (a soft cheese) and watching the castle’s lights sputter was a civilized way to usher in a Portuguese evening, which, I was soon to discover, starts late, shouts loudly, and oftentimes ends at dawn. The next afternoon I jumped on one of the eléctricos, the brightly colors trams that clack along the streets, impervious to slow-moving seniors and padding dogs. I hopped off at Chiado at the bottom of Bairro Alto and installed myself in A Brasileira, an art nouveau café on tony Rua Garrett. There I won the admiration of my waitress by polishing off half a dozen pastéis de nata, the dense custard tarts that have been a local obsession for more than 150 years. As I walked up the hill later, I felt as if I were in a low-budget sci-fi flick. I searched the cobblestone streets and found no one. I looked into several tascas, tiny family-run eateries, but all I saw were ghostly flickering televisions. Then bang — I looked up and a hefty women had thrown open her green shutters and wedged herself into the window. “Olá!” she hollered. Then another bang. Across the street, which was no wider than 15 feet, a second woman, just as well fed, flung open her window. She leaned out and the two launched into conversation. They looked at each other. Come back tonight,” said the first one. Twelve hours later the street was choked with people, tables, and chairs. I made my way through the crosshatch of streets that were lined with Goths, Gapsters, and grungers — a veritable United Nations of fashion statements, economic classes, and romantic agendas. The district had the youthful, electric charge of New York’s East Village of the ’80s, but with a watchful maternal presence. For every vampiric 19-year-old trying to squeeze her way into a Day-Glo vodka bar, there was a black-clad ancient woman with rosary beads and grocery bags sidling into her front door a mere six feet away. The place was chockablock with restaurants that seemed to have sprouted from nowhere, and I was determined to taste a much of my heritage as possible. First was Pap’Açôrda, with its huge Murano chandeliers and chic model-artist-author crowd. It’s known for its updated regional classics, the most famous being its namesake: açôrda, a soup swollen with hearty bread and, in this case, studded with seafood. I was also delighted by the peixinhos da horta, literally “little fish from the garden.” Nothing more than green beans that are battered and deep fried, they get their fanciful name from their shape. Indeed, when the waiter served up a bowl, they looked like a tangle of slender freshly fried fish. Warning: The attitude of the waiters is fierce and condescending, but the food is worth it. Around the corner was Bota Alta, for my money one of the best spots for classic authentic cuisine. The high-voltage blue interior was dark and mysterious. After explaining to Paulo Cassiano, waiter and nephew to owner Antonio Cassiano, that this was my first time at Bota Alta, he immediately suggested bacalhau à Brás, salted codfish scrambled with eggs and tossed with matchstick potatoes. Having made the dish many times back home, I searched the menu for something more exotic. I chose a fish I couldn’t pronounce and Paulo couldn’t translate. 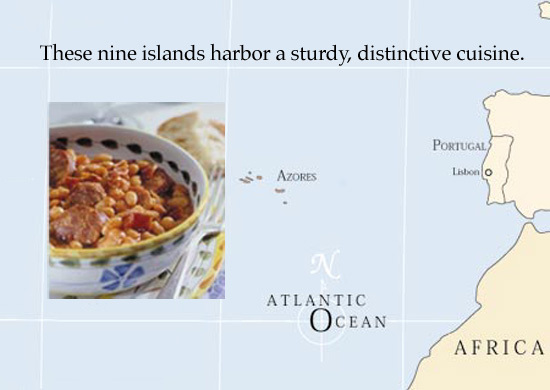 He nodded and returned several minutes later with a dish that looked suspiciously like bacalhau à Brás. “If you don’t like it,” he promised, “I’ll bring you whatever you want.” Charmed by his insistence, I dug in. The clouds of soft scrambled eggs encasing bits of salted cod and crispy matchstick potatoes were utterly addictive. “I’m sorry, but there’s something else I’d like.” He looked crestfallen,until I added, “The recipe.” He blustered with relief and then yelled something back to the kitchen. As of that day, my recipe was officially retired. Having eaten my way from the earliest days of the Portuguese empire to the end of the 20th century, on my last night in Lisbon I decided it was time for some 21st century cutting-edge cuisine. The old docks have been outfitted with new restaurants and glittery discos. As I got out of the cab I was lured by the pulsating of Lux, Lisbon’s most famous nightspot, but I headed instead for the wildly popular restaurant Bica do Sapato, which is partly owned by the actor John Malkovich. The retro-modern dining room, which, with its soaring ceilings, white tulip chairs, and hanging flying-saucer lights, could make Eero Saarinen’s TWA terminal jealous. I tucked in at a table along the placid Tagus, where I had a view of the Ponte 25 de Abril, the doppelgänger of San Francisco’s Golden Gate Bridge. “It’s a good thing the Inquisition has blown over,” I said to my Alan, dining companion, scanning the menu that was positively heretical. All the traditional ingredients were there — codfish, olive oil, pork, potatoes, shrimp, clams — but none of the dishes were even vaguely familiar. Case in point: for a starter chef Fausto Airoldi uses fresh cod (unusual) to make a tartare (very unusual here) that sits on a bed of diced vegetables and is topped with a grape-size scoop of olive oil sorbet (unthinkable, but utterly delicious). The surprises continued with pato à Brás. For this he gives duck breast, which is traditionally served over piles of rice, the egg-and-potato treatment reserved for salted codfish, like the kind served at Bota Alta. He adds a light tomato confit and steamed grelos, similar to our broccoli rabe, for good measure. After dinner, we walked back along the docks. I stopped and looked up at the city, which shimmered in the warm air. It was once my father’s capital, but in an act of familial generosity that’s centuries old, Lisbon had now been turned over to me. Love your article regarding Lisbon. I live in Canada, but I was born in the Azores. Visited Lisbon and S. Portugal on two different occasions; it was just a teaser, there is so much to see and do. This article brought such found memories and created a thirst for more…. Iberia, my pleasure. So glad you liked the article. David, Loved your writings on old and new Lisbon. It is indeed a city of contrasts, filled with ancient beauty and modern era. As soon as I read the first paragraph I was chuckling as when I moved back home after college with my Irish American husband, his reaction to the way we drive was comparing us to Mario Andretis and that our people are as nice and warm as they are crazy drivers. It certainly seems you have a wonderful experience and am sure there will be many more trips for you to our lovely country. Please let me know as I would love to recommend you new places that DO cook Portuguese cuisine yet with a modern twist. Also even though some may see it as a crime, do try some of the foreign restaurants we do have. I often went to Pap’Açorda and Bota Alta. While living there we would spend our nights in the bars in Bairro Alto and Alcântara area. The Lisbon nights are extremely vibrant and can be pretty wild yet you you well put with a maternal feel to them too. There are two older restaurants that in my mind are musts. The first being Sua Excelência and the other Gambrinus. Both are NOT budget conscious but so very good. The first is one of my favorite. There is no menu as the owner recites it and guides you to choose wisely. In terms of modern type of restaurants I would say Eleven may be my latest favorite! Sofia, thanks for the info. I think our readers will be able to add a few more restaurants to their lists when they travel to Portugal.